Residential Electric, Heating, Cooling & Insulation is a family-owned and operated company. We take pride in matching our clients with the best Bloomington electrical contractors around. No matter the course and scope of your project, we have someone who will get the job done. If you are constantly shocked by the lack of quality contractors in your area, call us today and speak to our Bloomington electrical contractor today! An electrical contractor is a business person who performs specialized construction work specifically related to the design, installation, and maintenance of electrical systems. Whether it’s high-voltage power transmission or low-voltage lighting, Bloomington electrical contractors ensure these systems work in a safe, effective, and environmentally conscious way. Broadly speaking, electrical contracting is the business of bringing power, light, and communications to buildings across the United States. According to the NECA, in the U.S., electrical contracting is an industry valued at over $130 billion annually, made up of over 70,000 electrical contracting firms employing over 650,000 electrical workers. An electrical contractor is different from an electrician; an electrician is an individual tradesman, while an electrical contractor is a business person or company that employs electricians. Both usually hold licenses and insurances to properly and safely operate a business, protecting the employees and homeowners/business owners from insurance liabilities. These requirements vary from state to state. 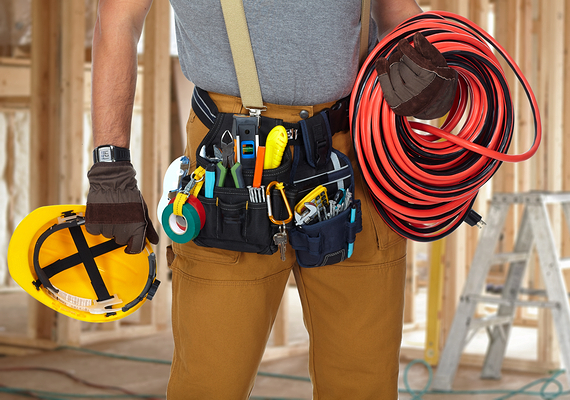 Electricians may work for an electrical contractor, or directly for individuals or companies. While electrical contractors and electricians both hold licenses, only electrical contractors hold the required insurances to properly and safely operate a business. These insurances protect the employees and homeowners/business owners from insurance liabilities. The next time you need an electrical contractor in Bloomington, call Residential Electric, Heating, Cooling & Insulation. Our seasoned professionals are available to you whenever you need them. Don’t hesitate; contact us today at 309-829-4230.